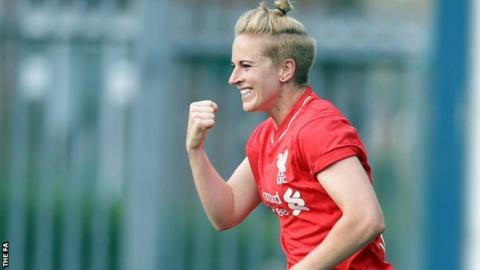 Natasha Dowie scored all four against Bristol Academy as Liverpool eased into the Continental Cup semi-finals. Christie Murray hit the bar for Bristol before Dowie opened the scoring from the spot after Georgia Evans brought Rosie Whelan down in the area. Jade Boho Sayo levelled after the break, only for Dowie to get her second in a goalmouth scramble. Dowie lifted the ball over Mary Earps to complete her hat-trick before adding a fourth in stoppage-time. Katie Zelem also went close for Liverpool, hitting the woodwork for the visitors, as the Reds progressed to the last four of the competition for the second time. "We knew before the game what a good player Tash Dowie is and we had a plan to try and stop the supply to her, but it obviously didn't work. "The story of our season is that some of our performances have been OK, but there's not been enough end product, and that was the case again today. "We have nobody to blame but ourselves for the position we are in because we haven't been getting the results we needed." "It was a fantastic day. We have beaten some very good teams to get to the last four and we can be proud of that. Now we want to keep it going, try to win the competition and take some silverware back to Liverpool. "Obviously the league title is beyond us now and we have had some big injury problems this season. "It's a huge competition for us and anyone can beat anyone in this league, so there's no reason why we can't win this cup." Bristol Academy: Earps, Dykes, Ladd,Brummel, Brown, Evans (Pinto 70), James, Weir, Murray (Passariello 75), Ingle, Jad Boho Sayo. Substitutes not used: Reid, Lawrence, Popadinova. Liverpool: Stout, Harris, Bonner, Murray, Ryland (Pacheco 82), Longhurst, Omarsdottir (Hodson 66), Zelem, White (Smorsgard 86), Staniforth, Dowie.